Sheriff: Teenager dead, 2 wounded in Maryland high school - Integration Through Media ....! GREAT MILLS, Md. 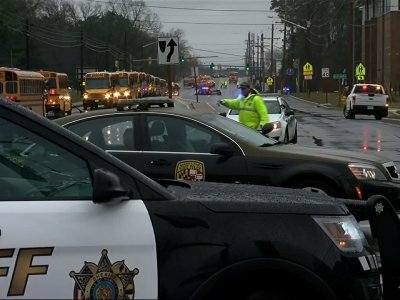 (AP): A teenager with a handgun shot a girl inside his Maryland high school Tuesday before he was fatally wounded during a confrontation with a school resource officer, a sheriff said. The officer and the student both fired a single shot at that point, and it wasn’t immediately clear whether he took his own life or was killed by the officer’s bullet, St. Mary’s County Sheriff Tim Cameron said. The 16-year-old girl was hospitalized in a life-threatening condition with critical injuries, the sheriff said. A 14-year-old boy also suffered a gunshot wound — it wasn’t clear who shot him — and was in stable condition. The officer, who doubles as a SWAT team member, was unharmed. Politicians responded swiftly, acknowledging that this shooting increases the pressure for action against gun violence as anger swells nationwide over the Valentine’s Day killings of 17 people at a Florida high school by a teenager with an assault weapon. The sheriff also praised the officer, Deputy Blaine Gaskill, a six-year veteran in his first year at the high school, for containing the situation in less than a minute. The shooter was identified as Austin Rollins, 17. His motive wasn’t immediately clear. “There is an indication that a prior relationship existed between the shooter and the female victim,” the sheriff said. Cameron said Gaskill was stationed inside the school, pursued the shooter and fired a single round. He said it wasn’t immediately clear whether that bullet hit Rollins, or the boy who was injured.